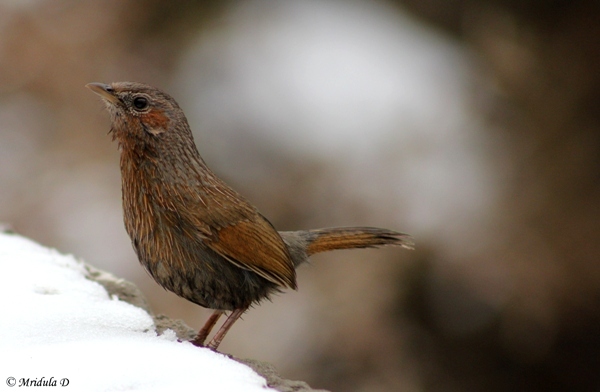 For this lazy Sunday I will go with the Streaked Laughingthrush. Oblivious to the snow around, it just kept playing or at least what looked like play to me. All kind of Laughingthrushs have beautiful voices but I did not hear it sing this time. These pictures were clicked at Narkanda, Himachal Pradesh while it got a cover of snow in late February and early March. I was taking a stroll along the main road and found them at the edge of the road. Going by their reaction to me, they were mildly used to being around human beings. It kind of ignored my presence. I am not sure I like cold weather but being in snow for a few days was jolly good fun. What is exotic weather for me was an irritant for the locals! The bird didn’t seem to mind it though. There was snow and slush on the roads and apart from the skiers no one seemed to be too happy about it. There is a ski program available with the HPTDC and people from HP police were doing it. They could ski on the side of the road while going to a different location. I took a walk on one of the quieter roads and it was absolutely amazing. Only an occasional jeep would come my way and I had the whole wonderland to myself! Other than this close sighting (I use a 75-300 lens for most of my bird pictures) I was not lucky with birds this time. I saw one from the woodpecker family, but before I could gather my wits around, it decided to vanish. It has been actually quite sometime since I went chasing birds. I guess it is about time! There was a time when I constantly posted birds on my blog. Then over a few years I clicked all that I could in the neighborhood. I still get excited about birds but only if I see new ones or if I think I will really get a good shot. This time when I was at Jagatsukh I managed to click some familiar and some new birds and I am quite excited about my sightings. So here I go. This was right at our hosts home at Jagatsukh. And there were so many house sparrows all around their place living in these hollows. They would keep visiting the Apple and the Apricot trees! 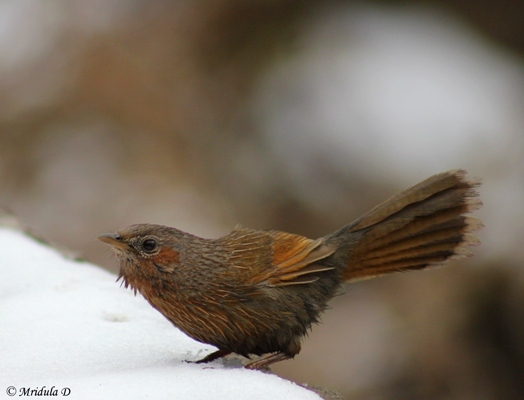 It was such a pleasure to listen to their chirping all day long! 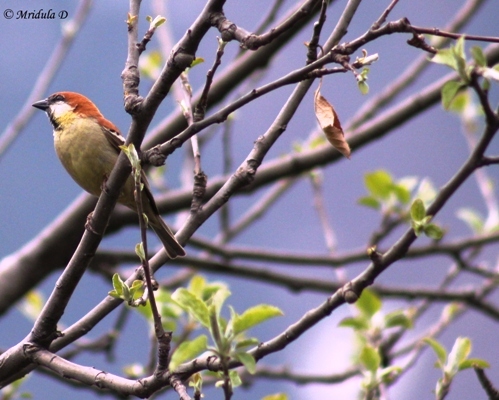 Initially I didn’t pay much attention to the Russet Sparrows. 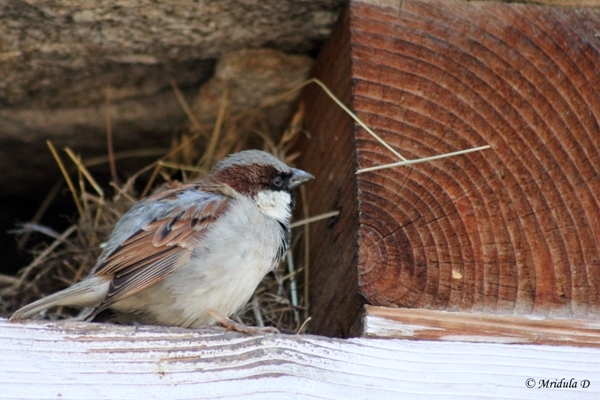 I somehow thought they were better looking house sparrows. It took a day for me to figure out that they were Russet Sparrows and not house sparrows. And then I started chasing them and they would sit only behind a lot of leaves and trees. In the end this was the best I could manage! Then on the last day of my stay I woke up at dawn and went out for a walk. There was no traffic on the road yet and birds were perching on the tress next to the road. 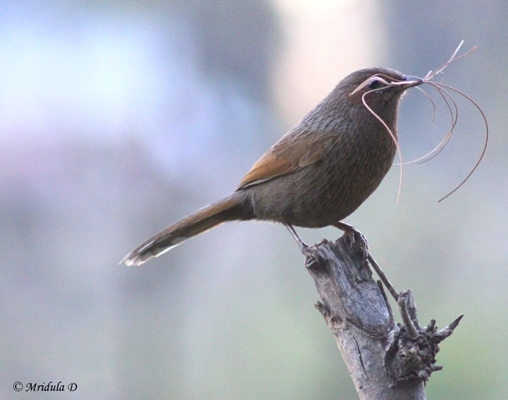 Like this Streaked Laughingthrush who was busy collecting material for the nest. 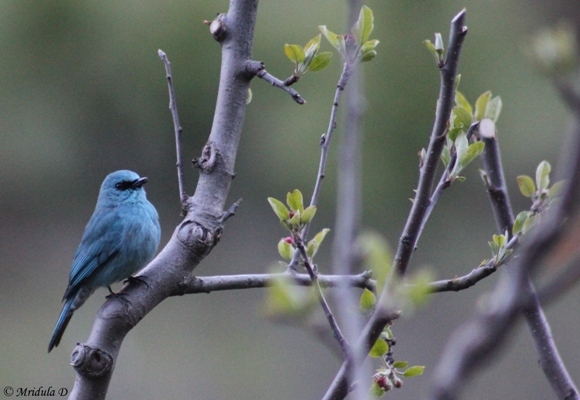 But the best was this Verditer Flycatcher. I was standing by the road and clicking landscapes. So I had the kit lens on the camera. And there came this lovely blue bird and sat on a clear branch. I told myself it was worth trying to change the lens then and there. So I took down my shoulder bag, opened it, then opened the kit lens. Then I fixed the 75-300 zoom, kept the kit lens in the bag and the bird was still waiting patiently right there! I could not believe my luck! I managed to click at least 5 shots before the bird decided enough was enough! After an hour or so the traffic on the road started and the birds were no longer coming to the tress next to the road even though I could still hear them!